Launched in October 2011, the Carl Zeiss Distagon T 25mm f/2 is available in both the Carl Zeiss ZE lens mount for Canon EF and ZF.2 mount for Nikon F. It works on SLRs, full-frame and crop-sensor DSLRs. Both versions feature the same optical construction, comprising 11 lens elements in 10 groups with a “floating elements” design to minimize aberrations at different distance settings. Although only manual focus, this Zeiss is electronically coupled to record EXIF data to the metadata and provide full metering incamera. There’s a 25cm minimum focus, f/2 – f/22 aperture range and a non-rotating 67mm filter thread, making it compatible with front-mount screw-on filters. The solid all-metal Carl Zeiss construction offers better quality than many modern plastic lenses and should last a lifetime. It’s not the widest prime in the Carl Zeiss range: 15mm, 18mm and 21mm versions are also available, and with “faster”, full autofocus options – like the $1749 Canon EF 24mm f/1.4 L II USM and the $1799 Nikon 24mm f/1.4G ED – it’s got some tough own-brand competition, too. 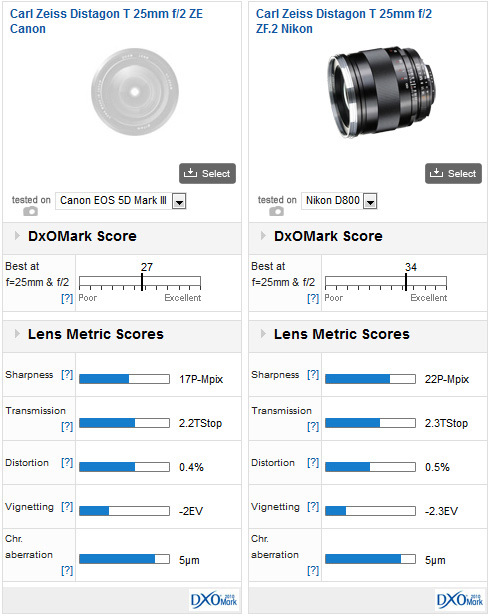 Will its DxOMark Lens Metric Scores make it the most attractive option though? Both lens mounts offer well controlled Distortion and Chromatic Aberration but the Nikon is in front for sharpness. 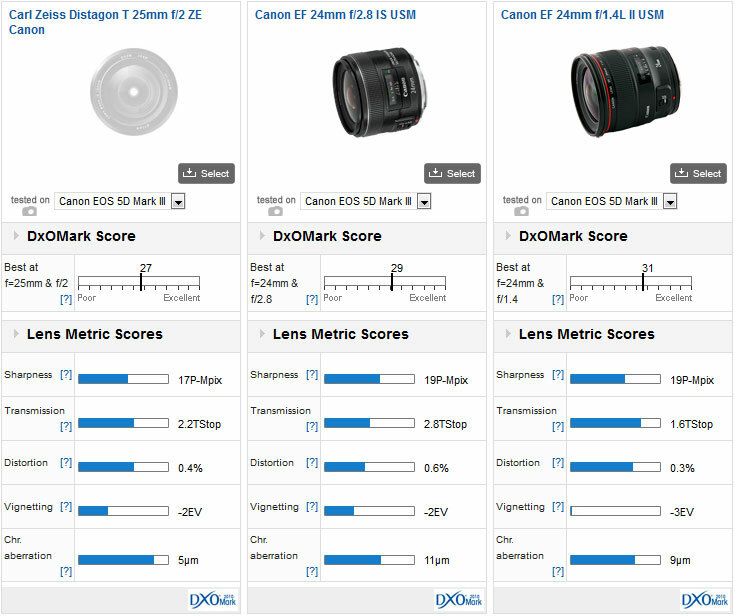 A score of 22P-Mpix tested on the D800 makes it the 2nd sharpest wide-angle prime we’ve tested. 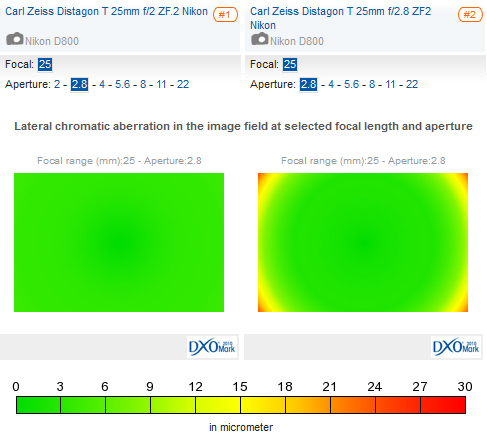 With a DxOMark Score of 34 tested on the D800, the Carl Zeiss Distagon T 25mm f/2 ZF.2 for Nikon ties with another Carl Zeiss wide-angle prime, the 35mm f/1.4 ZF.2 for 12th place of all lenses. For wide-angle primes both play second fiddle to the first placed Sigma 35mm f/1.4, which achieves a DxOMark Score of 39. However, the Distagon T 25mm f/2 ZF.2 doesn’t quite match the same heights when attached to other Nikon DSLRs, scoring 30 on the D3X, 28 on the D4, and just 24 on the D3. With a very impressive Sharpness score of 22P-Mpix on the D800, the Nikon version is the 2nd sharpest wide-angle prime tested, again, just behind the Sigma 35mm f/1.4 with 23 P-Mpix. The Zeiss offers homogenous edge-to-edge sharpness. Distortion and Chromatic Aberration are well controlled too, although Vignetting of -2.3Ev will require some post-production correction. It’s a similar story with the ZE mount version for Canon that offers the same homogenous edge-to-edge sharpness and well controlled Distortion and Chromatic Aberration. Its performance isn’t quite as strong as the Nikon version, however, with its best DxOMark Overall score of 27 tested on the Canon 5D MKIII, which ranks 137th for all lens/camera combinations on the database and 23rd for wide-angle Canon EF mount lenses. 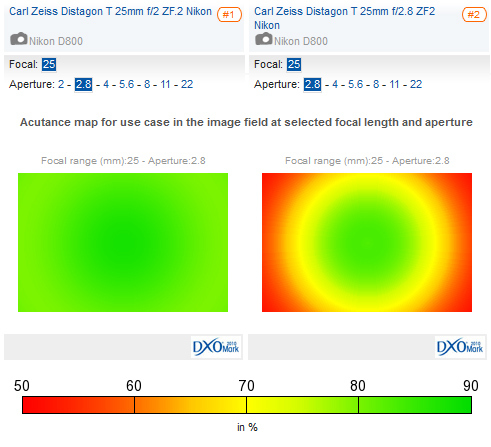 Sharpness is also down 17P-Mpix compared to 22P-Mpix on the ZF.2 version, but here the Canon is limited by the lower resolution of the 5D MKIII compared to the D800, and calculating the lenses’ efficiency ratio (P-Mpix/Pixels), the Canon is actually more efficient. Despite a significant advantage in sharpness for the Distagon T 25mm f/2 over the Nikon alternative, both offer the same overall image quality. The latest f/2 version offers improvements over the Distagon T 25mm F/2.8 ZF.2 option that’s been around since 2009. 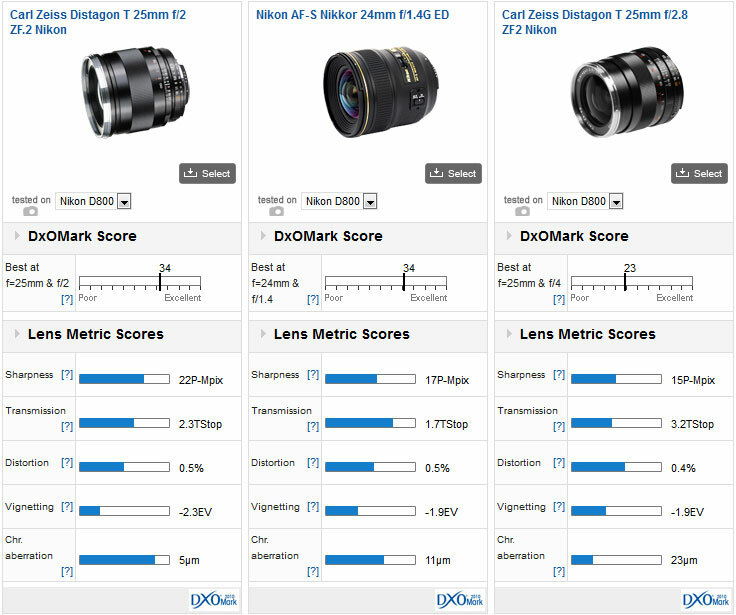 A DxOMark score of 23 compared to 34 (tested on the D800) demonstrates an improvement in image quality overall, and an increase in Sharpness of 7P-Mpix from 15P-Mpix to 22-P-Mpix is significant. The latest version improves homogenous edge-to-edge sharpness from f/2.8 to f/5.6, as well as eliminating Chromatic Aberration in the corners. Distortion is roughly the same, but the new lens boosts Transmission from 3.2Tstop to 2.3Tstop, making the new version +1 Stop brighter. All this needs to be placed in the context that the f/2 version is bigger, heavier and costs $700 more than the $1000 Distagon 25mm f/2.8 ZF.2, however. For “fast” wide-angle primes, Nikon has a challenger with their Nikkor 24mm f/1.4G that boasts a slightly wider focal length, larger maximum aperture and full autofocus. 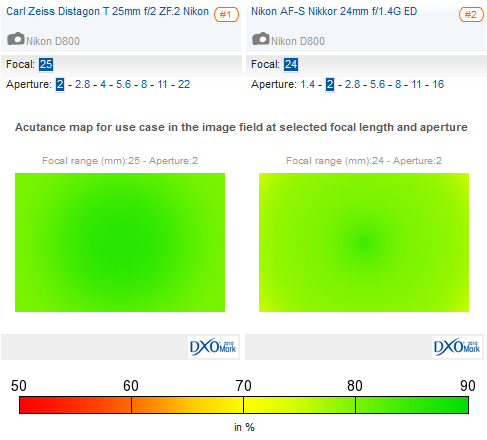 The Nikkor also achieves an overall DxOMark score of 34 to match the Zeiss, and the two lenses are close in terms of Distortion, Chromatic Aberration and Vignetting. The Zeiss version is much sharper though, with that impressive 22P-Mpix score offering +2/3rds resolution over the 17P-Mpix of the Nikkor. The Nikkor is +2/3rds of a stop brighter, however, with an impressive Transmission score of 1.7TStop. 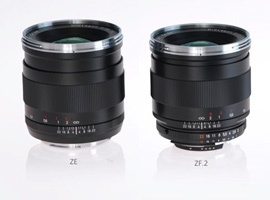 Taking all image quality factors into play, these lenses offer the same overall image quality. The Distagon T 25mm f/2 ZE doesn’t offer an advantage in overall image quality compared to both the cheaper own brand option as well as the better spec’d EF 24mm f/1.4L II USM. 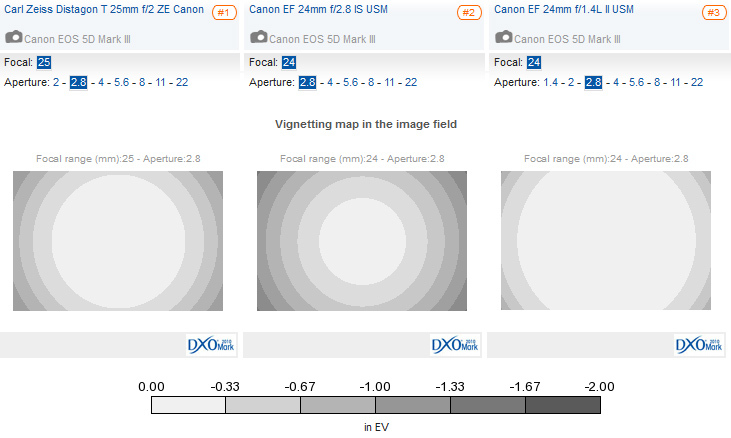 Canon offers a couple of competitors in their EF 24mm f/1.4 L II USM and cheaper EF 24mm f/2.8 IS USM, both of which just surpass the Zeiss option for overall image quality and sharpness tested on an EOS 5D MKIII. If you desire a maximum aperture, the f/1.4 L nudges out the Zeiss in all categories, with the exception of Chromatic Aberration. With an Overall DxOMark Score of 31 to 27 and sharpness scores of 17P-Mpix for the Zeiss, compared to 19 P-Mpix for the EF 24mm f/1.4L, there’s still really not much in it. Both lenses lack homogeneous sharpness at f/2, but it’s still within the realms of acceptable, although the Canon has better control of lens shading at wide apertures between f/2 – f/5.6. The EF 24mm f/1.4L is also +1 Stop brighter, and although costing more at $1749 it benefits from autofocus. If you can live with a slower f/2.8 maximum aperture, the cheaper $849 Canon EF 24mm f/2.8 IS USM is an excellent alternative option. With an Overall DxOMark Score of 29 compared to 27, it effectively offers the same image quality as the Zeiss – just beating the Zeiss by 2P-Mpix for sharpness and offering better edge-to-edge results at f/2.8. There’s not much in it overall for Distortion, Chromatic Aberration and Vignetting, and although the Zeiss wins +2/3rds Stop for Transmission the Canon 24mm f/2.8 IS USM is the more compact, lighter, cheaper option that also boasts Image Stabilization as well as autofocus. 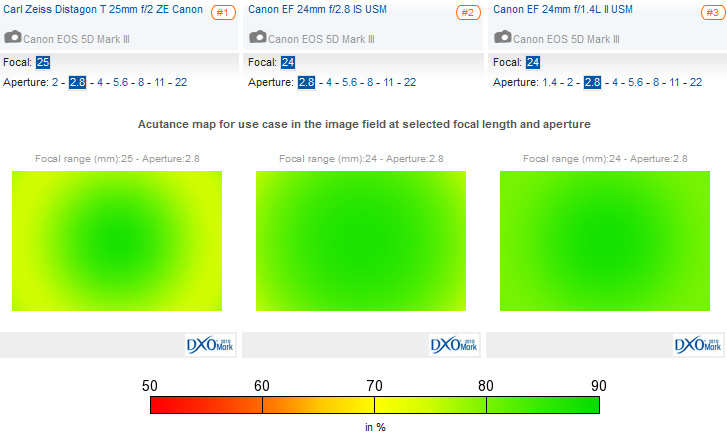 The 25mm f/2 ZE version for Canon isn’t as homogeneous as the Nikon mount ZF.2 at the maximum aperture of f/2. Different story with vignetting however where at f/2.8 the cheaper Canon displays the heaviest corner shading quickly followed by the Distagon T 25mm f/2 ZE that also requires post-production correction. The latest incarnation of the Carl Zeiss Distagon T 25mm wide-angle prime offers a real improvement in overall image quality and sharpness compared to the alternative Distagon T 25mm f/2.8 ZF.2. A sharpness score of 22P-Mpix for the ZF.2 version is impressive, but with a big $1699 price tag, own brand options – such as the $1799 Nikkor 24mm f/1.4G ED or $1749 Canon 24mm f/1.4L II – offer comparable if not slightly better image quality overall, as well as additional features, such as full autofocus, and a faster maximum aperture. What’s more, if you’re after a Canon wide-angle prime and can accept a f/2.8 maximum aperture with Image Stabilization, image quality on the EF 24mm f/2.8 IS USM just nudges out the Zeiss and is an excellent cheaper alternative.